The morning starts at 9am with Ben 10 who now has a million aliens who he can turn into (future illustration! yea=]). 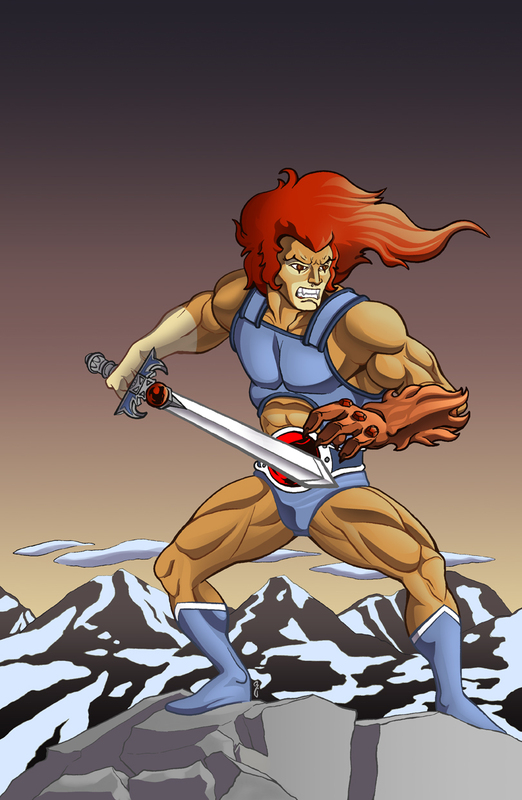 9:30 has the show that inspired this illustration and that's Thundercats. The cool thing about it is that they brought the show back from the 80's and reinvented it with a more modern bend. The Thundercats are lords of their world filled with different animals and have lost their kingdom to Mumra who is slowly taking over everything.... there's a lot of twists and suspense in the show, plus the cool designs for the show, so it is well worth tuning in each week. 10am Green Lantern who is starting things FAST with the Red Lanterns being the early protagonists (good idea strangely enough) and the Star Sapphires and Blue Lanterns have been introduced as well. They've alluded to the Yellow Lanterns at a jail where the innmates are tortured by being made to relive your fears over and over again (and the walls are speckled with Yellow crystals, giving Hal Jordan the creeps and a ready villian for next season). 10:30 has Young Justice on the pine and that show is just DC Animation at it's best. Over at Nickelodeon is The Legend of Korra at 11 am. This is the 4th season of Avatar, the Last Airbender (there are now new airbenders and they're AWESOME!) I have so many ideas for illustrations for this show, i wish I could get them all done! I think I have seen each episode about two or three times each on Demand and I am not getting tired of it at all.